Above: Hopkins service workers staged a three-day strike at the East Baltimore hospital in April. Johns Hopkins Hospital service workers will vote tomorrow whether to accept the hospital’s latest wage offer or hold a four-day strike starting Friday morning. 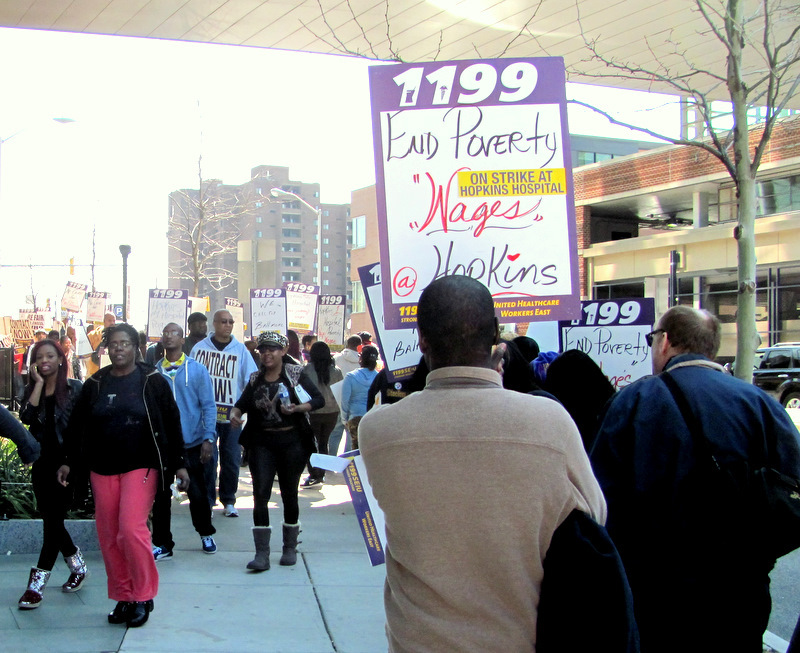 Contract talks between Hopkins and 2,000 service, maintenance and technical workers who belong to 1199SEIU United Healthcare Workers East have been stalemated for months. The union is seeking a $15 minimum hourly wage for workers with at least 15 years of experience by 2015, and a $14 minimum for workers with at least one year of experience by 2018. The hospital has countered with across-the-board raises of between 1.5% and 2.75% over the course of the contract, making for a minimum wage of $12.25 an hour by 2018, according to the union. Last week, the union gave notice for a strike – the second in three months – starting at 6 a.m. Friday. Union spokesman Jim McNeill today called the strike “likely” given the the frustration of the rank-and-file. The union describes Hopkins’ pay for maintenance and service workers “poverty wages” and says many of its members rely on food stamps and Medicaid to make ends meet. The hospital’s latest offer would leave many workers continuing to need public assistance, McNeill said. Hospital officials have declined to comment on the union’s charges or the status of the talks, saying they will not negotiate through the media. During the last work stoppage, Hopkins kept patient services and hospital operations running with management and other fill-ins.